#1: First player in line carries a puck and goes straight in on the goalie for a shot. Alternate sides of the rink (top goes opposite ways, then bottom goes opposite ways). #2: Two players skate through the neutral zone in a single regroup. Players from the top and the bottom on the same end of the rink (right side in the picture) go at once. While they single regroup through the NZ, the other players pass a puck, eventually getting it to the two regrouping players before they attack 2v0. #3 Two players skate through the neutral zone in a double regroup. Players from the top and the bottom on the same end of the rink go at once. While they double regroup, the other players in line pass a puck anywhere they want (diagonal, straight, whatever), eventually getting it to the regrouping players before they attack 2v0. 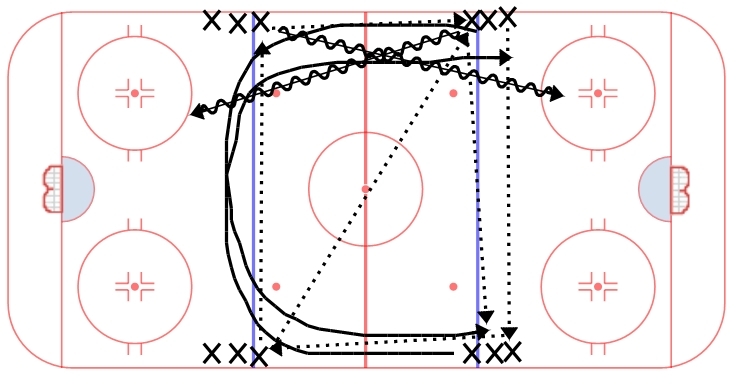 This drill is a good warmup drill, allowing players to get a good skate in, goalies to get some good shots, and a lot of creativity and passing in the neutral zone. Always look forward to your drills…it would be great to see more drills involving progressions that work on systems or set plays, starting with one simple concept then adding to it multiple times. Thanks again!